Change is coming to Nirmathas once more, at the edge of a sword. The Ironfang Invasion Adventure Path begins in late summer in the year 4709 in the rural Nirmathi town of Marideth's Crossing, nestled alongside the only major crossing of the Marideth River within 50 miles upstream or down. The campaign begins as artisans, farmers, miners, shepherds, traders, and trappers from across the region gather for the seasonal Market Festival to send their raw materials to market in the “big city” of Tamran and trade for those essentials—finished goods, clothing, magic, and alcohol—that make surviving the next season easier. The PCs could be longtime residents of Marideth's Crossing, injured veterans recuperating from the Long Winter, or trappers and farmers who arrive to sell their wares, catch up with friends, or stock up for the season, only to find their lives thrown out of control by unexpected events. Two years ago, in the late fall of 4707, an early winter came to Nirmathas that clung to the land like a curse. The winter persisted for eight months and brought with it nearly ten feet of snow, arctic winds, and temperatures cold enough to freeze a person solid. The supernaturally conjured winter also brought with it animals and monsters native to far northern environments, and a rampaging army of outcast orcs from the Hold of Belkzen, lashed into the service of a malicious winter witch of Irrisen bent on conquering Nirmathas. Thousands of Nirmathi people were captured and enslaved by the orcs, dozens of settlements were burned to the ground, and the winter threatened to paralyze any attempt that Nirmathas could make to defend itself. In the height of desperation, a single woman rose to drive off this winter. Sloan, a young woman from the village of Wintersbreath deep within the Fangwood, liberated her fellow villagers from the orc invaders and led them to safety in the druid enclave of Crystalhurst, before ultimately bringing them to the town of Marideth's Crossing. Sloan and her allies liberated Marideth's Crossing from the bandit group known as the Brotherhood of the Black Talon and settled the nearby Fangwood Keep as her base of operations. From here, Sloan would lead a campaign against the winter witches, broker a treaty with the nearby nation of Lastwall for aid, and even call upon the mercenary service of the legendary Ironfang Legion—an army of hobgoblins led by the peerless warrior Azersi. Together, Sloan and her allies would defeat the winter witch of Irrisen, end the curse of winter plaguing Nirmathas, and bring summer back to the land. In the aftermath of the winter, the town of Marideth's Crossing was the hardiest survivor and its population boomed from locals wishing to pay their respects to the Hero of Wintersbreath and to settle such storied lands. Travelers from as far away as Korvosa in Varisia come to hear stories of the fantastical battles Sloan and her companions participated in and life has, by and large, returned to normal. In the months leading up to the present day, Sloan's allies have largely parted ways from Marideth's crossing to pursue their normal lives. Even the Duchess of Fangwood Keep herself has once more disappeared into the wilderness, needing some time and space away from the bustle of civilization. The War of the Long Winter may be over, but its aftereffects are felt all throughout Nirmathas. Many towns and villages still lay in ruin and displaced citizens that fled to Lastwall and Varisia have yet to return. New trade routes are still being established, and it will be several more years before Nirmathas is back to its normal self. Fear that the nation of Moltune will use this opportunity to strike grows by the day, and rumors that they have already begun a siege against the—ostensibly neutral—dwarven Sky Citadel of Kraggodan stokes these fears of a coming war. With Marideth's Crossing being such a small town—roughly 400 souls call the town their permanent home—residents generally know one another by sight, and even consider regular visitors from across western Nirmathas to be neighbors. Ideally, at least one character is a native of the town, and other characters should have reason to visit often enough that at least a few residents know their names. Many of the campaign traits (see below) offer reasons for a character to live in Marideth's Crossing or its surrounding environs. To help players acclimate to the nation and the regions surrounding Nirmathas, a short guide to the Marideth River Valley region of Nirmathas can be found below. This gazetteer can help you understand what it means to be Nirmathi, while additional details on the nation can be found in Pathfinder Campaign Setting: Lands of Conflict. the capital of Tamran, newly arrived to trade for local resources; a military veteran from the Molthuni front far to the south, on a resupply mission to Nirmathas’s breadbasket; a wounded veteran from the War of the Long Winter recovering in the country; or perhaps a militia deserter passing through while fleeing the nation. Characters with no strong ties to Nirmathas may be part of a merchant expedition from any of the nations bordering Lake Encarthan. Varisian caravans occasionally traverse the Bloodsworn Vale to the northwest (where Sloan the Hero of Wintersbreath helped open trade routes between Varisia and Nirmathas), migrating into and out of Nirmathas in the warm months. Refugees from Nidal to the west occasionally survive the treacherous journey over the Mindspin Mountains, and find Nirmathas a paradise compared to their shadowenshrouded homeland. Your character could be a half orc escaping from the hardscrabble orc tribes of the neighboring Hold of Belkzen, an elven game hunter from Kyonin challenging her skills against the wildlife of the Fangwood, or an explorer from Andoran or Taldor mapping the war to prepare a proper report for her respective government. Your character may be even more unusual—Nirmathas’s wilds are seen as a refuge by many considered monsters by society—and all manner of creatures and criminals might flee to the relative isolation of the Nesmian Plains and the Mindspin Mountains to escape their past. area, a reason to oppose invading monsters, or no pressing reason to return from whence they came. You’re playing the Ironfang Invasion Adventure Path, but what sort of character should you play? What sort of character fits the themes of wilderness survival, dungeon exploration, and guerrilla warfare against a far larger and better-equipped army? The following hints, suggestions, and character options are designed to help you create characters perfectly suited to meeting the challenges and dangers this Adventure Path has in store. The following suggestions are not exhaustive, and there are thousands of concepts that can find a place in this campaign. This Adventure Path provides plenty of motivation for any good- or neutral-aligned adventurers, from protecting unsuspecting citizens to restoring peace to seizing glory and wealth as the spoils of battle! While NPCs want their homes restored and their families protected, they are also willing to pay for services rendered, motivating both heartfelt PCs and greedy mercenaries. Even evil adventurers (with permission) might enjoy that same fame and fortune, or see every reason to take revenge against enemies who wrong them personally or destroy their property. classes at home in natural settings—including barbarians, druids, hunters, kineticists, rangers, and shamans—will have an easier time addressing the earlier challenges they face (perhaps too easy, if an entire party consists of wilderness-themed characters). as animal companions or eidolons—will rarely need to leave one of their core class features behind to avoid upsetting locals. While most sorcerer or bloodrager bloodlines are feasible choices for the Ironfang Invasion Adventure Path, the following suggestions fit the theme or provide abilities especially appropriate to this campaign: deep earth (Advanced Player’s Guide), destined, elemental, fey, or verdant (Advanced Player’s Guide). The oracle mysteries and shaman spirits with the strongest ties to the themes of the Adventure Path are battle, lore, nature, stone, and wood (Ultimate Magic). Suitable witch patrons for the Ironfang Invasion include animals, elements, endurance, healing (Ultimate Magic), plant (Heroes of the Wild), transformation, trickery, and vengeance (Ultimate Magic). Of course, these choices are only suggestions, and players should not feel limited to these options—most bloodlines, mysteries, spirits, and patrons would work well in the Ironfang Invasion Adventure Path. The majority of the Ironfang Invasion Adventure Path takes place in southern Nirmathas, from the dense woodlands of the Fangwood Forest to the gentle Nesmian Plains to the rugged Hollow Hills. The best choices for favored terrain are forest and underground, but plains and mountains (which includes hills) are both good additional choices. Solid favored enemy choices include fey, humanoid (goblinoid), magical beast, and plant. Given the campaign’s location, characters likely hail from Nirmathas or have good reason to visit the area regularly. Many are likely local trappers, hunters, woodcutters, soldiers, or scouts. Nidal, Varisia, the Hold of Belkzen, and Lastwall all share borders with Nirmathas and make excellent homelands for non-Nirmathi characters, as does any nation that borders Lake Encarthan. Remote as it is, Phaendar and the surrounding area attract an eclectic variety of personalities, from young hopefuls training to join the Chernasardo Rangers or Nirmathas’s army to wounded veterans recovering in relative peace far from the front to the south, and from quirky explorers and researchers to outsiders fleeing persecution for their heritage or faith. Characters in the Ironfang Invasion Adventure Path can originate from anywhere, but should have reason to stay in Nirmathas and fight back against monsters taking advantage of the young, war-torn nation. The Ironfang Invasion Adventure Path offers characters plenty of opportunities to negotiate with potential allies, uncover ancient history, and spy on enemies. The most common languages of Nirmathas are Common and Hallit, with heavy pockets of native Dwarven and Elven speakers. Characters with additional language choices stand to learn much about the region’s history if they speak Sylvan, and can negotiate with or threaten their inhuman adversaries with knowledge of Draconic, Goblin, and Undercommon. Nirmathas lies at the heart of Avistan, but consists largely of unclaimed wilderness and bustling colony towns less than a century old. The vast majority of Nirmathi are humans of Chelish, Kellid, Taldan or Varisian descent—often blended within any single family. Because Nirmathas was once part of the trade route connecting Cheliax to its Varisian colonies, human heritages from all across the world can be found in various corners of the nation. attracted to the primordial wilderness of the Fangwood. Less common races also call Nirmathas home (with Game Master approval). Ratfolk from nearby Druma see Nirmathas as a land desperate for arms and rich in untapped resources. Dhampirs and fetchlings sometimes number among those refugees fleeing from neighboring Nidal. Nirmathas itself is home to a small population of undine, who are sometimes born to families who settle near the nation’s mysterious Marching Springs. On rare occasion, aasimars from Lastwall, as well as changelings and skinwalkers from Ustalav, make their way into Nirmathas, usually hoping to escape their pasts. Religion is not a cornerstone of the Ironfang Invasion Adventure Path, but faith is still deeply important to the people of Nirmathas, and divine spellcasters are far more common within its wilder corners than arcane or psychic spellcasters. Most communities honor Erastil as both the lord of hunters and the guiding hand of small communities. Cayden Cailean, as the god of freedom and heroism, is exceptionally popular among those who consider themselves freedom fighters. Gorum and Iomedae both enjoy a strong following along both sides of the Molthuni front, but the chaotic and free-willed Nirmathi hew more closely to the tenants of Our Lord in Iron. Nirmathas’s proximity to Kyonin has also invited some converts to elven gods, and the cult of Calistria in particular has found many fervent worshipers across the nation. The Green Faith is of particular importance to the people of Nirmathas. Many lay people know the cult’s basic tenants, and various trappers and lumberjacks pay their respects to the land each day before they begin their work. Easily the regional center of the Green Faith and its worship, the hidden community of Crystalhurst provides an excellent hometown for druid, hunter, or ranger characters. Character playing through the Ironfang Invasion Adventure Path will benefit most from a wide variety of skills and abilities. That said, skills that aid characters in enduring the wilderness or dungeon dangers will be of great benefit. Survival and Stealth will both play important roles in the early stages of this campaign, and the variety of terrains will provide ample opportunities for Acrobatics and Climb to show their value. As always, Perception is a handy skill for almost any adventurer. nature will provide the most benefit. Over the course of the Ironfang Invasion, characters will have limited access to many of the resources they may normally take for granted, especially those provided by large cities. Nirmathas’s largest community, Tamran, does not feature prominently in the Adventure Path and is only a small city, capable of providing spellcasting of 4th level or lower and magic items worth 4,000 gp or less. Consequently, feats that improve a character’s self-sufficiency, such as item creation feats, Eschew Materials, Herbal Components (Heroes of the Wild), Master Alchemist, Well-Prepared, or Witch Knife all help keep a player character supplied and prepared despite the lack of infrastructure to rely upon. The Ironfang Invasion Adventure Path takes players all across and beneath Nirmathas in their campaign against inhuman invaders. The campaign begins in the town of Marideth's Crossing, and player characters should be natives of the community or its surrounding environs, or else new arrivals with some reason to remain invested in the area. Each player character must select one of the following campaign traits as one of her two traits available at character creation. You’ve spent more of your life around animals than people, and find them easier to understand. Benefit: You gain a +1 trait bonus on Handle Animal checks, and Handle Animal is always a class skill for you. Your trait bonus increases to +5 whenever you attempt to “push” a wild animal to perform a trick for you, so long as its attitude is indifferent or friendlier. You may target creatures of the animal type with charm or compulsion spells as if they were humanoids, but unless you have another ability to make yourself understood to animals, you must still succeed at a Handle Animal check to “push” your target in order to communicate specific requests. You were raised deep in the Fangwood Forest, but in your childhood the Darkblight overtook your community, and blighted fey attacked your friends and family. Even after escaping, you barely survived infection by the otherworldly fungal disease and still bear a terrible scar from your ordeal. Benefit You gain a +2 trait bonus on Fortitude saving throws against disease or poison (your choice), and your scar now throbs painfully in the presence of unnatural creatures, immediately alerting you to their presence. This sixth sense alerts you to the presence of aberrations, oozes, and all creatures with the blighted fey and fungal creature templates within 30 feet (though it doesn’t indicate their exact location). You can always act during the surprise round against such creatures, and you aren’t considered flat-footed against such creatures in the first round of combat. You’ve pledged your skills and your life to the Chernasardo rangers, studying to protect your homeland from foreign invaders. You currently remain a neophyte in this secretive guerrilla army. You have yet to be entrusted with many of their secrets, and spend a great deal of time training with the old ranger Aubrin in Marideth's Crossing to hone your skills of hunting and tracking. Benefit: In forest or plains terrain, you may reduce a single target’s effective level of concealment against you (from total concealment to concealment to not concealed) by studying your natural surroundings as a move action. This reduced concealment ends immediately once the target moves from its current location. At 10th level, you may study your terrain as a swift action instead. You make your way in life by putting people back together after the rigors of the world take their toll—brewing herbal remedies, setting broken bones, and treating diseases. Your reputation as a healer precedes you, especially in times of need. Benefit: You gain a +1 trait bonus on all Heal and Knowledge (nature) checks, and one of these skills is always a class skill for you. Any time you restore hit points using the Heal skill or a cure spell (but not with channeled energy, lay on hands, or a magic device such as a potion or wand), you restore 1 additional hit point, plus 1 for every 2 class levels you have beyond 1st. During the Long Winter, the invading orc forces at the command of an Irriseni winter witch took everything you valued in life and left you barely alive. When you recovered, you joined forces with the Duchess of Fangwood Keep and fought against the invading forces in one of three major battles: The Siege of Crystalhurst, the Siege of Fangwood Keep, or the Battle of Marching Springs. Benefit: Once per day as a full round action, you may shrug off some of your injuries and immediately heal a number of hit points equal to your Constitution modifier + 1 per level you possess. Your reputation for tenacity inspires your neighbors, and you gain a +1 trait bonus whenever you attempt to influence residents of Marideth's Crossing with Diplomacy or Intimidate checks. At 6th level, your reputation spreads further across the nation, and you may apply your trait bonus on Diplomacy and Intimidate checks to influence all humanoids in Nirmathas. During the Long Winter you fought in a militia organized by the Hero of Wintersbreath and fought alongside the powerful hobgoblins of the Ironfang Legion, learning a little bit about their combat styles and brutal wartime efficiency. As a result, you discovered some weaknesses in their martial styles and discipline. Benefit: You gain a +2 dodge bonus to AC against creatures with the goblinoid subtype, and once per day when you attempt an Intimidate, Sense Motive, or Stealth check against a creature with the goblinoid subtype, you can roll two dice and use the better result. You hail from the dwarven Sky Citadel of Kraggodan in southern Nirmathas and have spent the past several years among the surface people serving as a mercenary in the war, trading with Nirmathi towns, or simply seeing the surface world. Molthune’s recent siege of Kraggodan has squelched any hopes you had of returning home, and now you struggle to find a home on the surface. Benefit: Thanks to your travels, you gain one of the following as a bonus language: Common, Hallit, Varisian, or Undercommon. In addition, your homesickness means time spent underground revitalizes your spirits; whenever you are underground—either in natural caverns or an artificial complex—you automatically stabilize if brought below 0 hit points, and if reduced to 0 hit points (or you are stable and conscious when below 0 hit points) you do not take the usual 1 point of damage disabled characters take from performing a standard action. This revitalizing effect fades after 4 consecutive days spent underground, but returns after you spend more than a week above ground again. When the Long Winter ended, a strange birthmark manifested on your body, resembling a pair of red stag antlers. Ever since this mysterious mark appeared, you have found yourself at one with the powers of nature. Benefit: You gain a +1 trait bonus on Survival and Knowledge (nature) checks and one of these becomes a class skill for you. Additionally, you can choose to cast either speak with animals or speak with plants once per day as a spell-like ability. This choice is made each time you use the spell-like ability. In the aftermath of the Long Winter, you pursued the surviving agents of the Winter Witches across Nirmathas, participating in an inquisition to drive them out of the land. Your opponents were not always witches, nor were they always aligned with the Winter Witches, and some innocent lives may have been endangered—or worse. Benefit: You gain a +1 trait bonus on Intimidate checks to demoralize enemy spellcasters and Intimidate becomes a class skill for you. Additionally, you gain a +2 trait bonus on all saving throws against spells from an opponent you have successfully demoralized so long as the condition persists. Over a decade ago, bandits took everything you valued in life and left you barely alive. You managed to rebuild your life in the years since, and your tenacity has made you a local legend. checks. At 6th level, your reputation spreads further across the nation, and you may apply your trait bonus on Diplomacy and Intimidate checks to influence all humanoids in Nirmathas. You’ve seen the horrors of war, and had hoped you’d seen the end of it. You’ve retreated from the fighting—likely from the front line with Molthune or the Winter War, but maybe from the crusade of Lastwall or the political infighting of Ustalav—and now just want to protect and provide for those you care about. Benefit: You gain one of the following as a permanent class skill: Appraise, Heal, Knowledge (history), Sense Motive, or Survival. When you perform an aid another action to improve a creature’s Armor Class, you increase its AC by +4 rather than +2. The war in the Chernasardo—the borderland between Nirmathas to the north and Molthune to the south—has been going on for decades, yet the land here looks as it has for thousands of years: a winding stretch of forested river valleys and wind-swept hills, dotted with the occasional settlement of lumberers and farmers. Perhaps the forest's seeming immunity to the ravages of war is a result of the countless twisting canyons, tors, and impenetrable groves that make up this majestic region; such primeval terrain is often simply too difficult for large armies to move through. Perhaps it is the hardy, independent people of the Chernasardo, who refuse to let something as wasteful as war change their daily routines or the world around them. Or perhaps there is a darker, more mysterious explanation: perhaps nature itself refuses to let humanity have its way here. The Marideth River valley is a key strategic location in the war between Molthune and Nirmathas; both sides vie for power in this region, since a strong foothold in the borderland often means the difference between victory and defeat for dozens of nearby skirmishes. The following are some of the most interesting places and people found around the Marideth River valley. 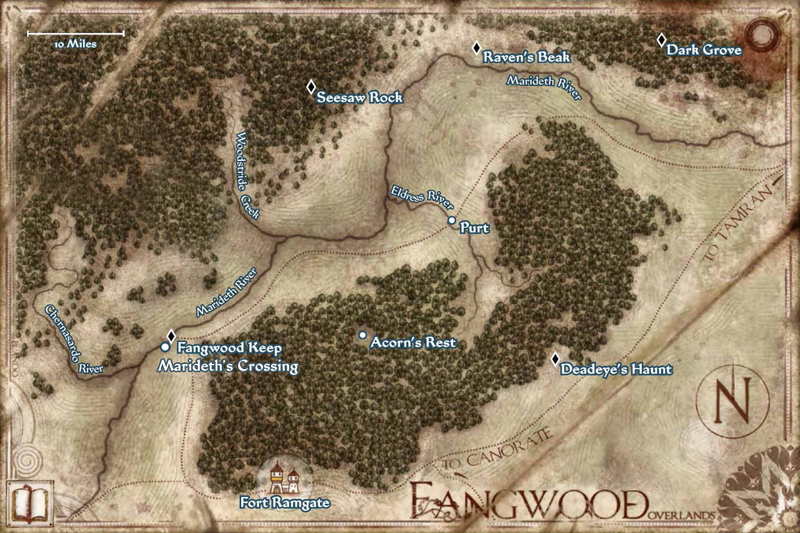 This small community hosts just over a hundred souls, and is located in the southern spur of the Fangwood. Its leader is a messianic follower of Gozreh who goes only by the name Duskwater (N female half-elf druid 8). Duskwater firmly believes that the Eye of Abendego—the permanent hurricane blowing off the western coast of Garund—is actually the literal child of her patron deity, and that once it reaches maturity, it will cover all the land with water. Most of the other druids who occupy Acorn's Rest are not so zealous and hold less-extreme views. A strange, otherworldly blight among the trees has been spreading in the Fangwood far to the north for some time now, and patches of the taint have begun to crop up elsewhere in the Fangwood as well. The foul outbreak has taken a firm hold in the area now known as Dark Grove, and the druids of nearby Acorn's Rest are working hard to find a cure for the blight. Most believe the tree-borne disease to have natural origins, although one of their number, a woman named Androssana (CN female human druid 7), believes that Abyssal powers may be to blame. This small valley was once sacred to the Erastil, god of hunting and farming, but was the scene of a gruesome battle between Nirmathas and Molthune several years ago. The area is now believed not only to be haunted, but also to be the domain of undead creatures that rose from the battlefield. Fangwood Keep is a former Molthuni fort built over an ancient elven ruin. It is now home to the central authority of the Marideth River Valley. This fortified bastion is the largest Molthuni settlement in the area and is governed by a former Kellid barbarian named General Hakar. Fangwood Keep was initially built in close proximity to Fort Ramgate to allow for quick reinforcements and restocking from the Molthuni city, but the perseverance and expert tactics of the Nirmathi guerrilla fighters to the north have again and again shown that the border cannot be controlled so easily. Rumors persist that four months ago, an assault on Fort Ramgate left the entirety of the Molthuni garrison slaughtered and a portion of the fort in flames. There is no known party responsible for the attack. The small hamlet of Purt is located on Eldress River, a small tributary to the Marideth. The settlement is composed largely of human subsistence farmers who are said to grow the largest cabbages in the region. After countless raids by unscrupulous Molthuni mercenaries, the leaders of Purt decided to call on one of the druids of Acorn's Rest to help reinforce the wall of thorns that surrounds the village's perimeter. Now thick thorn walls, 20 feet in height and 8 feet in width, surround Purt on all sides. The inhabitants have cut several hidden passages in the walls, but staunchly refuse to reveal their path to any outsiders. This border fort was destroyed in 4706 during a battle between a small strike force of Molthuni magi and a powerful earth elemental summoned by a Nirmathi druid. The military high command in Tamran has been reluctant to fund rebuilding efforts, as the location is too remote to truly be useful for their purposes. Since the fort's destruction, the ruins of Raven's Beak have been overrun by a nest of ettercaps and giant spiders, and they are avoided by nearly everyone in the region, though hopeful explorers speak of a small treasure vault still buried beneath the crumbling fortress. Named after a prominent granite outcropping that resembles a child's toy from certain angles, the grove known as Seesaw Rock has been home to a tribe of centaurs for centuries. Naturally nomadic creatures, the centaurs of Seesaw Rock command a wide swath of land around their favored winter camp, and claim much of the forest north of the Marideth as their domain. The centaurs generally prefer to avoid confrontations with the local villages, but are not afraid to rebuke those who trespass onto their sacred grounds. They are led by Qallak (N male centaur ranger 5), an honorable warrior who is quick to anger and slow to forgive.